At the beginning of Life of Pi, the narrator promises that it is a story to make you believe in God. When I got to the end of the book, for a moment I thought that the book had failed in its purpose. However, after a moment of trying to puzzle out what the author meant, I realized it was one of the most brilliant arguments in favor of believing in God, and one that particularly appealed to the writer in me. So let me begin this way: These are macaroons to make you believe in coconut. I hated coconut all my life. I don’t mean I disliked it; I truly thought there wasn’t a single thing worth eating that came from those hard, hairy, brown things. To be honest, I was a picky eater when I was young, but coconut was on its own level. I hated the way it squeaked between my teeth. I recognized it from the first bite of any unfamiliar food. Chewy yet not, sticky but not soft, the appeal was entirely lost on me. It wasn’t just the texture that bothered me. One of my most vivid memories from my trip to Turkey involves coconut, this time in liqueur form. My mother and I devoted a week of our trip to a blue cruise, bay-hopping around south-western Turkey on board an eight-passenger gulet, a wooden sailboat, though if the sail was ever employed during our trip, it was only once. Our captain could steer the boat one-handed, the other hand occupied by a can of Efes Pilsner. All of my American no-drinking-and-driving mental programming made this amusing to watch, but not concerning. He obviously had the hang of it, and really there wasn’t much to run into other than small islands. I figured one of us would see the island coming and grab the wheel. He already let us do that whenever we wanted. He didn’t speak as much English as the other crew members, but he was a likable, relaxed guy all around, friendly and happy. One of the things he seemed most excited about was Wednesday night. “On Wednesday, we party!” he would repeat to us at odd times, without any explanation. Considering we were floating on a beautiful blue expanse, rarely sharing a bay for the morning, afternoon or night with more than one other gulet, we thought it was a joke. Who were we going to party with? We were already lounging and tanning (well, not me), swimming, eating and drinking amongst ourselves. I wasn’t sure what would change that short of a hot tub dropping from the sky onto our tiny deck. Wednesday came, and we piled in a taxi van to cross the peninsula to Marmaris. Surprisingly, we made it there alive and spent the afternoon shopping in the bazaar. I found a bracelet at a silver shop there, one so unique that I’m never able to describe it to anyone in detail, which I would subsequently lose in the back of another taxi when we returned to Istanbul. We returned to our boat, once again surprised to be alive, but tired from the day’s trip. The captain greeted us and urged us to join him for the party at the discotheque on the shore. As a group, we looked at the scrubby, dry, isolated coastline. Still, the invitation to party was repeated, and it was very tempting to see just how a discotheque was managing to hide in the middle of nowhere. It turned out that “discotheque” was a slight overstatement, at least in my mind. A wooden fence around an outdoor bar didn’t quite match the image in my mind. We sat down on cushions around the low table in one corner, chatting with the owner (who seemed to be good buddies with our captain and the captains of the other gulets anchored in the bay) while his sons minded the bar. My mother, who was doing her best to be a bad influence on me during my college years to combat my stick-in-the-mud tendencies, tried to get me to smoke from the hookah. Tried, but didn’t succeed. At one point, I looked through a crack in the fence behind me and saw a gigantic shadow of a scorpion. My gaze zeroed in on the very small scorpion throwing it, but it certainly made me question the wisdom of sitting nearly on the ground there. The coconut in this story–I hadn’t forgotten!–arrived then, in small, skinny glasses filled with a dubious pink liquid. I tried to refuse, and learned they were on the house. I took a tiny sip, and my nose wrinkled immediately. Coconut. Jolly Rancher and Coconut in burning alcoholic form. I set the glass down and forgot about it…until another came. Now, I was pretty used to guys flirting with me in Turkey by then, including the one I usually describe as a Turkish Antonio Bandaras but better looking. I hadn’t had any of the bad experiences with it that you hear about from women traveling in foreign countries, just entertaining ones, so I had no problem with it. A glance over at the bar made it pretty obvious why I was getting free drinks. If they’d sent over an endless supply of Diet Coke (I can’t believe I drank that), that might have been different, but coconut? I wasn’t impressed. But it turned out that they were making up new drinks just for me, and my mother reminded me that it was rude to refuse hospitality like that, as long as it was harmless. So, I drank both drinks. Or, at least I’m pretty sure I got through them all, since I vaguely remember singing for other drunk people in the “discotheque” under the stars. The moral of the story is that foreign travel may broaden your palate considerably, but some foods just never have a chance. Coconut did not receive the same invitation into my eating life that many of the other foods I encountered did. Over the next few years, though, a few coconutty things slipped into my diet, like fresh coconut cracked open on the beach on my honeymoon in Costa Rica (it was okay) or coconut milk in Thai curries. Nevertheless, I was fairly certain I’d never like anything that proudly proclaimed a coconut-heavy favor. With that in mind, cue my disappointment with being assigned to make the coconut macaroons at my first cooking job. I was assisting the American-style baker in the restaurant’s bakeshop, and despite the fact that everything I’d tasted of hers then (and now I can say everything since then, too) was the best I’d ever had of those items before, there was no way that I was going to like the macaroons. Who likes to make food they don’t like at all? Not me. Not unless it makes someone close to me very, very happy, and even then I’ll get grumpy and complain about it. That aside, I was going to be working with coconut every week, smelling it, touching it. I wasn’t pleased. Still, it was my job, and I did what I had to do while she instructed me how to make the macaroons. I pulsed the coconut in a food processor. I mixed the gooey ingredients in a large bowl. I got my hands all sticky and slimy scooping small mounds of it onto the sheet pan. (My technique had yet to develop then.) 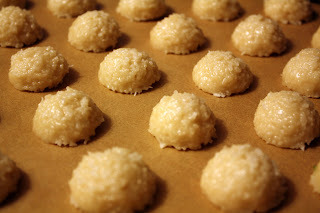 They went into the convection oven, and I watched them carefully, turning them so they acquired a golden brown that surprised me, since all the macaroons I’d seen were giant, white balls with shreds of coconut sticking out of them every which way. But they still weren’t going to taste good. No way, no how. Oh my goodness I was wrong. The differences I’d noticed before all served glorious purposes. Grinding the shredding coconut did away with the stringiness I hated about it. The small size made for the perfect marriage of warm, squishy insides and golden crunchy/chewy outsides. After one taste, it became a ritual for me to eat one hot macaroon every week as soon as possible to when they came out of the oven. They’re delicious cold, and actually take on a nice chewiness if stored in an airtight container for a few days, but when they’re fresh and warm, they’re heaven. But it wasn’t just the macaroons that I came to love. 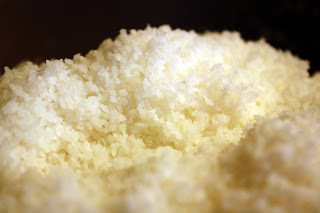 Soon there after, the assistant pastry chef gave me a taste of his coconut sorbet as it came out of the mixer, and I’ve adored coconut sorbet ever since–as long as it doesn’t have shreds of coconut in it. I’ve even been known to order drinks with coconut rum in them. Consider this my public apology to my Turkish bartenders for not liking their drinks. These aren’t the macaroons that made me believe in coconut. I know, I’m sorry, but the recipe isn’t mine. I can’t bring myself to share the recipe without permission. Something in me doesn’t quite want to share it, either, which is strange because generally I’m all for sharing my recipes and knowledge. But these are special. Magical. However, I’m not going to tease you and then leave you empty-handed. I’ve been working on a number of variations, tweaked and changed enough that I won’t feel like they’re not mine to share. Raspberry-Pomegranate, which tastes like a jam sandwich cookie, but with the texture of a coconut macaroon. Cocoa Nib-Creme de Cacao, a grown-up chocolate chip cookie. But the most successful so far was a fusion of two of the variations I’ve tried: the macadamia nut center and the lime-rum macaroon. My second run of these today yielded great results. 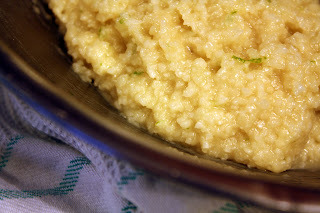 The zest of two limes seemed like it would be too much, but the lime flavor was perfect–blending enough with the coconut to be subtle, but definitely there. I wanted to post the recipe itself tonight, but I have a few things to work out first. 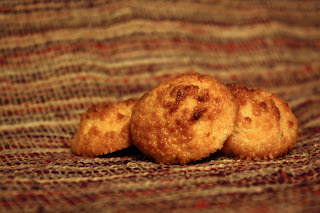 I still want to amp up the rum flavor, and the macaroons are spreading too much, most likely due to the fact that I’m still getting used to my oven, but I need to rule out flaws in the recipe before I post it. In the meantime, I’ll demo the technique, which you could probably apply to other macaroon recipes out there. First, pulse the coconut in a food processor. You may have to do it in more than one batch, depending on the size of your recipe and the size of your food processor. Add the coconut to a large bowl with the flour and the sugar and mix thoroughly. 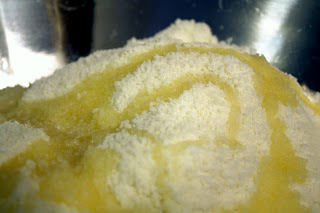 Drizzle melted butter over the coconut mixture, then use your hands to work it evenly in, rubbing any clumps with drier parts of the mixture until you don’t see any more clumps. Whisk egg whites, cream, corn syrup, rum, and lime zest together. Pour the wet mixture in with the dry mixture and stir with a spatula–or better yet a bowl scraper–until combined. Form the the macaroons with a small scoop and place them in even rows on a Silpat or parchment paper. 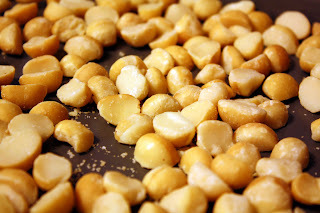 A note on the macadamia nuts: they should be salt-free and toasted. Two or three minutes in the oven at 350 degrees is plenty. 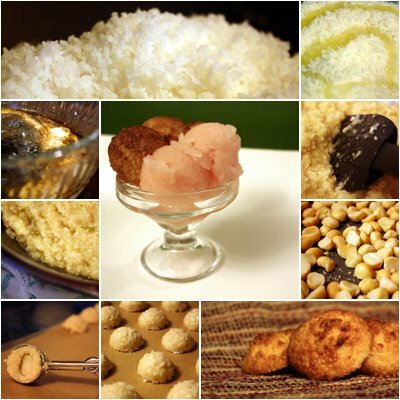 Also, if you toast the macadamias immediately before making the cookies, watch them in the oven carefully, because the nuts will heat the macaroons from the inside and speed up the cooking process. 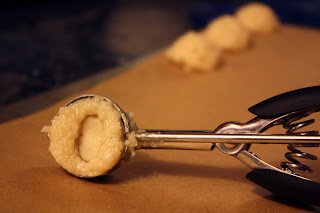 To put the macadamia nuts in the center of the macaroons, press one into the cookie while it is still in the scoop, and then fill the empty space behind it with the coconut that gets squeezed out the sides. Make sure the bottom of each macaroon is flat and clean. Bake the macaroons at 350 degrees for 18 minutes, turning the pan around after the first ten to color them evenly. They should look golden brown and crispy, but not turn dark brown. Cool on racks, and make sure to eat one while they’re still warm. I paired the lime macaroons with a grapefruit sorbet I’d randomly decided to make up a mix for last night to use up some aging grapefruits. They worked quite well together even though they weren’t made for each other. 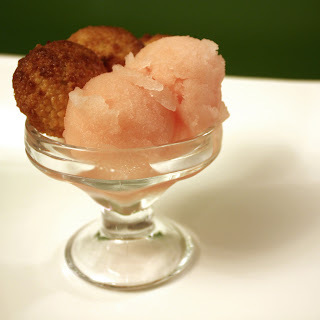 The cold and the natural flavor of the grapefruit cut the sweetness in the sorbet, and so it was a counterpoint to the sweeter cookies, rather than competing for the same sort of attention. 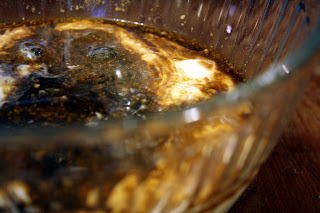 Stay tuned…I hope to have this recipe perfected in the near future! They’ll only be Macaroons Based off of Macaroons to Make You Believe in Coconut, but I hope that they’ll taste good all the same. This entry was posted in Baking and Pastry, Desserts, Featured and tagged butter, coconut, Cookies, grapefruit, lime, macadamia nuts, nuts, rum, sorbet, vanilla on January 3, 2009 by Jessica Petersen.